I like my Millers Falls No. 1124 miter box. It came with the latest-model Disston saw, made around the time Eisenhower was president (1953-1955.) And while the saw isn’t considered great quality compared to earlier vintages of the same model, it certainly is fantastic quality compared to what’s on store shelves today. It also has the huge advantage of a saw plate that fits snuggly in the saw posts with very little play side to side. That said, the handle is big, boxy and feels like gripping a brick. By contrast, my Disston miter saw made c. 1897-1917, fits rather nicely in my paw. I especially like the rounded hump in the middle of the backside of the handle because it fills my palm. The picture may not show it, but the vintage handle’s hump is more pronounced. I thought about modifying the 1124’s original saw handle. After all, others have done it with fantastic results. 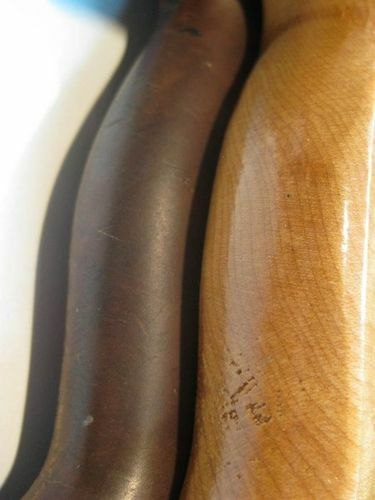 But, when it came to it, I didn’t have the heart to apply files to a 60-year old handle that is in such phenomenal shape. So I back-burnered any solution. Then one day, I was walking across the living room with a jar of peanut butter when, all of a sudden like, my lady—who was carrying some chocolate incidentally—ran into me. Peanut butter…chocolate…combined…and a handle solution was born. 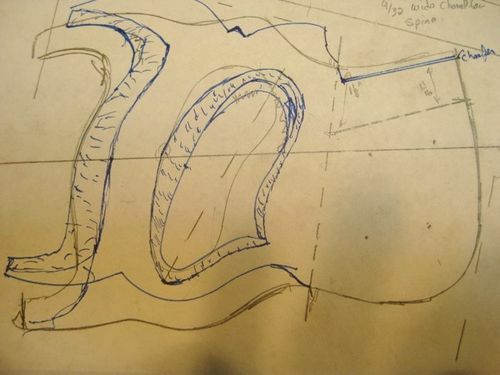 The plan was to trace the front portion of the late-model saw—so as to provide an identical “platform” from the stock handle with which to affix the new handle. That’s the peanut butter. 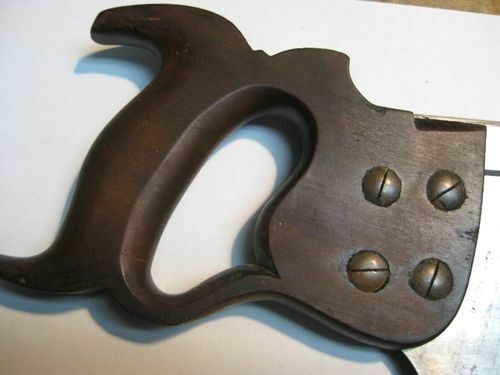 Then, I would “graft” a tracing of the comfy rear handle portion of my early 20th century Disston. That’s the chocolate. Better together. 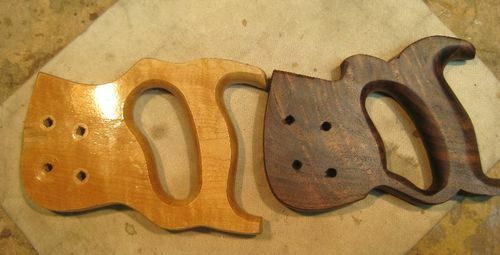 Incidentally, I did that before I discovered TGIAG Toolworks’ saw handle template library. 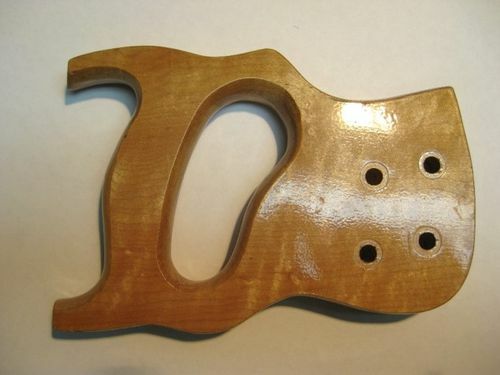 They have Disston miter saw handle templates for both a three-hole and four-hole miter saws. A word to the wise. Don’t take the layout of the bolt holes as gospel. To avoid a nasty surprise, follow the process I outline below. After removing the original handle, I traced its outline onto some paper. Then superimposed the early-model handle over it, and lined up key reference points. 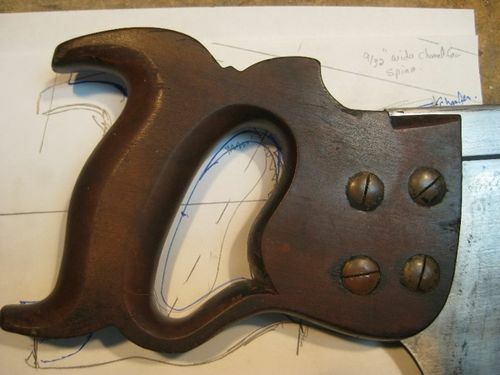 Then traced the rear portion of the desired handle onto the late-vintage saw’s drawing. The combined template resulted in a handle (rear part penned in blue) with a higher hang than the original. At the time, I didn’t think anything of it because the vintage saw also has a higher hang. 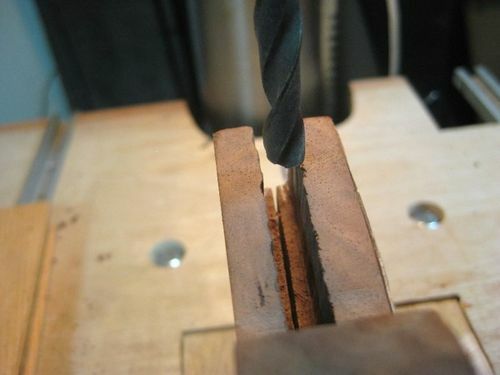 However, having used the saw, I have to be conscious to keep the saw teeth level, and minimize any downward pressure. 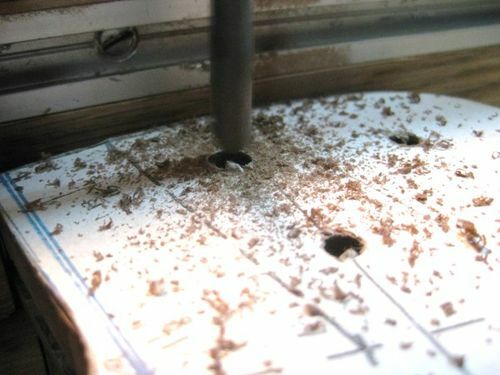 Otherwise, the teeth “catch” in the kerf and make for a rough cutting action. The next miter saw handle I make will have a neutral hang to it. 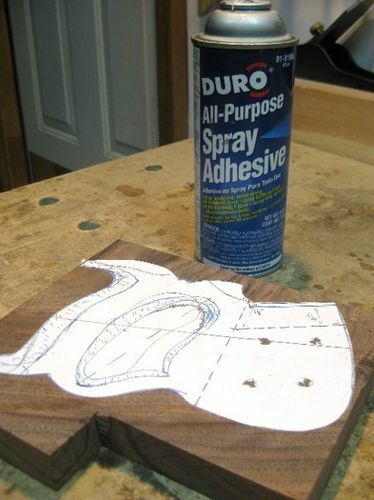 After cutting out the template, I sprayed on some adhesive and affixed it to a crotch walnut blank. Being sure to align the grain for strength and beauty. Next, I loaded up some Forstner bits to remove waste from curved areas. Followed by cutting out the handle’s outline with a coping saw. At this point, I drilled the holes for the saw plate. I do this now because if I botch it up, and have to toss the handle, I won’t have wasted hours of work shaping it. 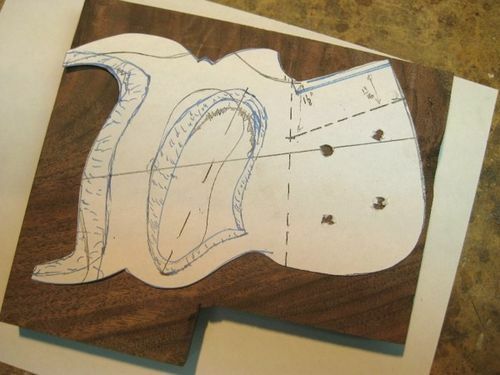 Jedi Woodworking Master, Bob Rozaieski has a neat trick to accurately complete this step . 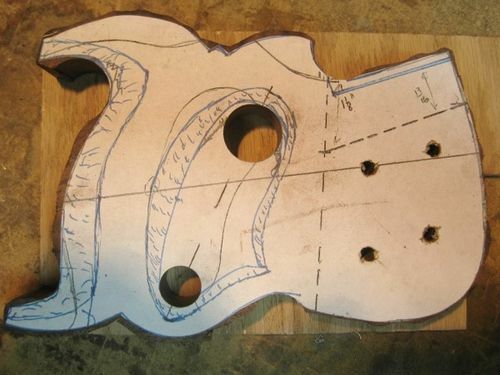 Superimpose the saw plate over the template, “center-punch-mark” the holes with a bit of the same diameter, then drill the holes and make sure they line up. Next, I slotted the handle. I do this now because if I screw it up, and have to throw away the handle, I won’t have wasted hours of work shaping it. Jedi Saw Master Matthew Cianci has a cool little trick to do this. 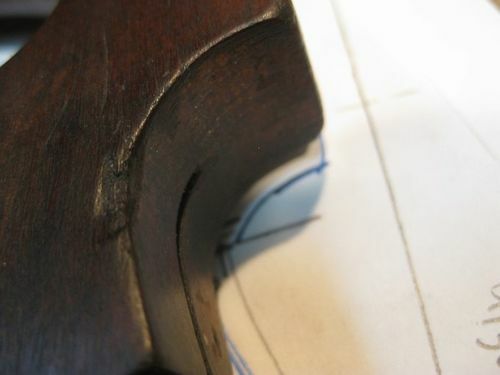 The slot accommodates the saw plate. Drilling a mortise makes room to seat the spine. And dry fit the handle to the saw plate to make sure everything fits all nice and comfy. The late-vintage nuts and bolts hardware sit flush to the handle face. So there’s no recesses to be drilled. However, the nuts are larger in diameter than the hole I bored straight through for the bolts. So I had to drill 5/8” of the way through the nut side to accommodate them. With these critical steps out of the way, it was time to spend hours shaping the tote. I was so engrossed in this process that I forgot to take pictures. And this step took the most time by far. 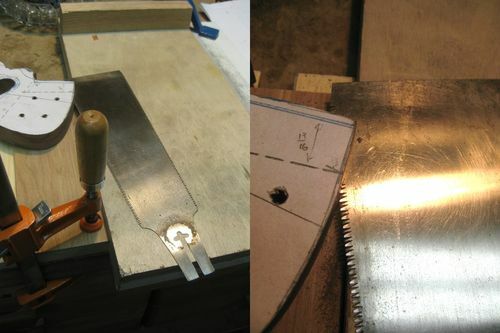 I was more aggressive using the rough rasp on the second handle I made for a different miter saw. This significantly reduced the shaping time. The first thing I did was square the edges to the faces, bringing the stock to within 1/32” of the template outline. 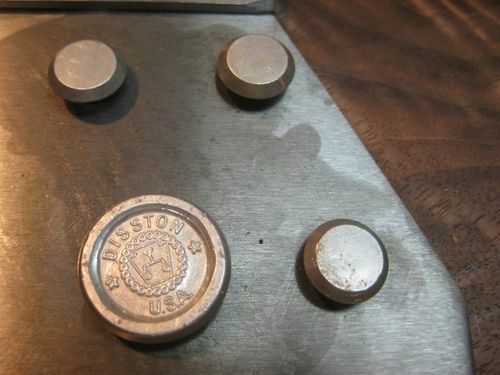 This was made easier with a drill-press-mounted sanding drum. To make the transition points along the edge, such as the triangular “nib,” I used a chisel. Then I used a rasp to rough out the contour of the handle sides. That was followed by strips of 60 & 100 grit papers to shape/smooth all the contours for the inside and outside edges. From there, I worked through the grits to get the surfaces baby smooth. I like the feel of BLO plus paste wax on handles. It has a natural feel in the hand. I may finish the next handle with shellac to better protect against moisture transfer, but for now, I’m satisfied. After the finish dried, I compared it to the original. And marveled at the crotch grain all on its own. Then put it on the saw. And was satisfied with some test cuts. More importantly, the new handle fits my hand much better than the original. So now I get the benefits of a quality vintage box without enduring the hardships of a cheap handle. That’s my peanut-butter cup handle. Nice work Brad. It looks great. Beautiful wood on a very nice custom job. Excellent blog Brad. I’m going embark on my first saw handle soon and you saved me a lot of research. Nice job Brad. That’s a lovely piece of Walnut too. Well done Brad. That piece of walnut is a great upgrade. Very nice new handle, great work on this. I enjoyed your detailed write-up too, makes a great tutorial. Very nice! Thank you for doing such a great write up on the process. Stunning piece of wood and a great upgrade to an old saw. Strong work Brad! Bookmarking this to try myself – thanks, wonderful handle.